Located on Lookout Mountain, just a few minutes drive from Chattanooga, Tennessee, a visit to Ruby Falls is an awesome experience. At 145 feet deep, this thundering, underground waterfall is in America’s deepest cave. It has been called one of the world’s most famous natural wonders and is more than eleven hundred feet beneath the mountain. Guided tours are available every fifteen to twenty minutes and are conducted on a paved, gradually sloped pathway after an elevator ride down to the cave. The interesting rock formations and other awesome geological sights, some of which are millions of years old, are pointed out by the tour guides as hundreds of gallons of water gush down the falls every minute. 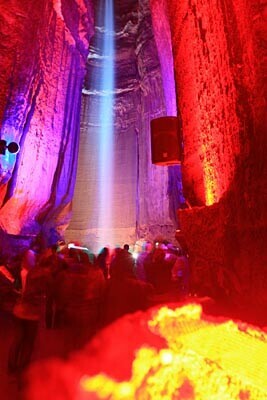 Ruby Falls itself is estimated to be thirty million years old. Ruby Falls is a limestone cave, limestone being a type of rock that is dissolved easily by ground water. At one time a great amount of water entered the cave which by erosion hollowed out the top area of the falls. This place is now referred to as Solomon’s Temple. Visitors can experience the many types of cave formations called speleothems. These are stalactites that are formed by water dripping from the ceiling, stalagmites formed by minerals building up on the floor, and columns, when they grow together. Also found are drapery or curtains formed when water oozes through small cracks in the ceiling, flowstone that is formed from flowing water and deposited in thin layers on the floor, and finally helictites that are a type of stalactite but grow in twisted shapes in any direction from the ceiling. Food service is presented in the Cavern Café or the Fun Forest Grill, which has a lovely view of the Tennessee River Valley, and two gifts shops are available. Free with admission is the Lookout Mountain Tower, a 70 foot tower overlooking the gorgeous area of Lookout Mountain. A new adventure has been added to Ruby Falls by way of zip lines suspended over the treetops with an obstacle course also including ladders, nets, walkways, bridges, tunnels. During the holiday season Ruby Falls is decorated with a special holiday light show, including holiday music and decorations and costumed characters. Last updated by Ginny on 23 December, 2011 in Destinations.